The following is only my opinion. I did not receive reimbursement of any kind for my review. In case you can't read it (you can try clicking on it to enlarge), Leah Aks was headed to Norfolk, Va. to meet her husband. While in her cabin, she heard a strange sound, wrapped the baby in a blanket and made it to the top deck. John Astor's wife grabbed the baby and put it in a lifeboat. I went through the whole museum and saw several things on Madeleine Astor, but nothing on Leah. At the end of the museum, there is a wall that lists all of the passengers. They are divided by which class they were, then if they survived or perished. Leah and her baby were both on the survivor list, but I didn't know how they were reunited. On my way out, I asked one of the workers, and found out that they were reunited on the Carpathia, the ship who rescued the survivors. I googled Mrs. Aks, and found out that her great-granddaughter lived in Knoxville at one time. Mrs. Aks gave her daughter the middle name of "Carpathia". I also found out that, while on the Carpathia, Mrs. Aks walked by a woman with a baby, and she immediately recognized it as hers. She went to the captain, who required proof. The baby had a birthmark on his chest which was confirmed, so the baby was returned to her. I expected the Grand Staircase to be scaled to the real thing, for some reason. It was beautiful, but small. I think I expected the museum to be set up as the ship was, so that was a tad bit disappointing, too. 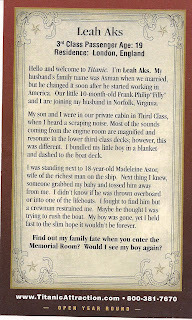 The artifacts from the Titanic were interesting to see, but they seemed to have the same things in every room. They have one room set up so you can feel how the air felt that night, and how the water felt. There is no way that I could've survived even for 5 minutes in that water. The Titanic Experience had interesting points to it. Would I go again? Probably not, but I am glad I went once. I think I would like to go...once. I went there with a group of GF a few years ago. It was very moving. My name was Brigid. I was a Survivor. But many of those in our group were not survivors. It really gave me perspective. Nice that you and your YS got to go there and share some time together. Good memory maker! We saw it in NYC...it was interesting I thought, a little 'touristy' but I guess there's no way around that. I liked how they engaged you by giving you one of the passenger's identities. Not sure how freaked out I would be if I had to prove my baby WAS really my baby. Awful in so many ways! I saw a Titanic Exhibit when I lived in LA - and I loved it. This makes me want to go again :). Thanks for your very honest review, I have wondered what is was like. We have thought of visiting Branson and wanted to check it out. I always like history, the problem with Arizona is that most history is fairly "recent" since it's a newer state. About 15 years ago, my husband and I took a trip to London. Because he is a pilot, he really wanted to go to Greenwich (Prime Meridian) and so we went to Greenwich for the day. 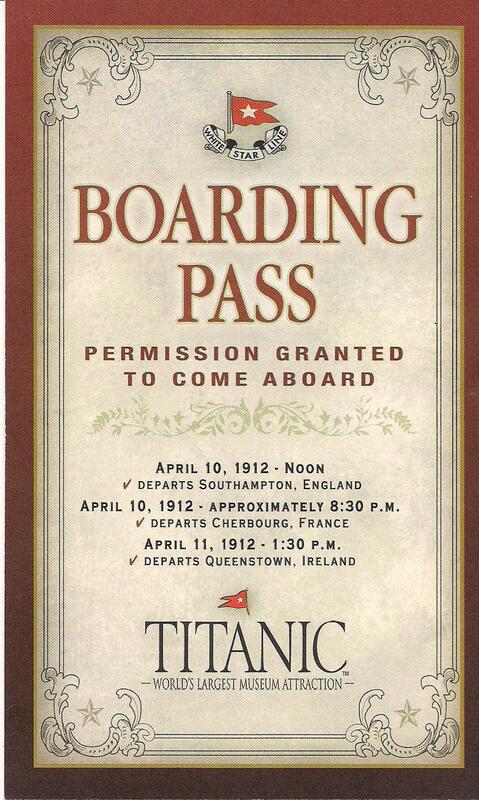 We had no idea, but when we got there we realized that the Titanic Exhibit was being shown there. I have to say that I loved it. It was amazing what they were able to recover - china, crystal, unopened champagne and wine bottles, wallets, jewelry,etc. We were completely awed by the whole experience. It was similar to visiting the Anne Frank House in Amsterdam. The realization that something you've read about and known about for years was REAL...and to see such concrete proof of the lives that were lost...I don't know if I would go again, but I am SO glad that I did get the opportunity to go. That sounds sooooo cool!! I'd have loved to visit it! Thanks for sharing this with us! hi mary-We had the Titantic museum at the Denver Museum of Natural History. Same deal with each of us assigned a passenger and at end of tour we found out the fate of our passenger. Alot of personal property was on display. Very cool, but definitely a one time visit! we have snow in the mountains today! Crazy in Colorado! 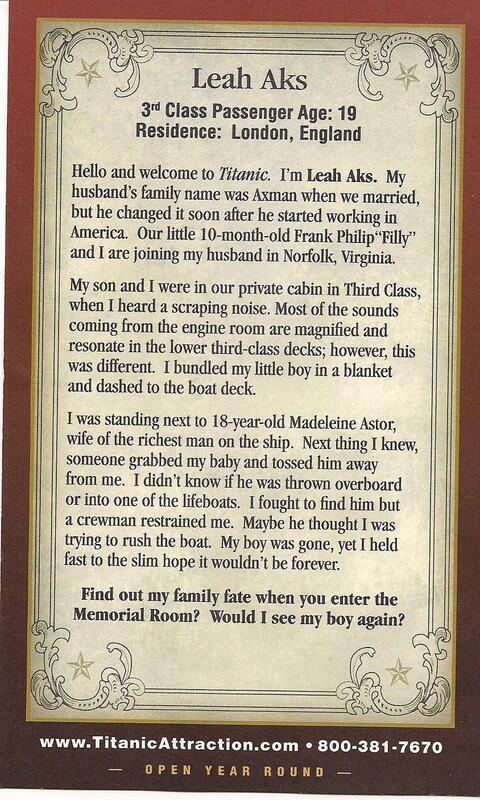 I have always been intrigued by all things Titanic. I would love to visit at least once. Your story was soooo interesting! Thank you for sharing it! That sounds like a very interesting thing to do. I haven't been to the Holocaust musuem but I knew that you follow someones life through it. We have one here in LA that I should go to.